Capt. Gershom Bradford (Martha’s Vineyard) to his wife, Sarah Hickling Bradford (Duxbury, MA), November 14, 1812. The largest collection by far held at the Drew Archival Library is that of the Bradford Family. It spans 200 years, has hundreds of letters, photographs, shipping papers, journals, etc, etc. It is the go-to collection here when I need to know anything about Duxbury history – each generation of the family was heavily involved in social movements, town politics and, dare I say it, gossip. So, when I thought it might be fun to scan something from 200 years ago today, I immediately went to see what a Bradford had to say. 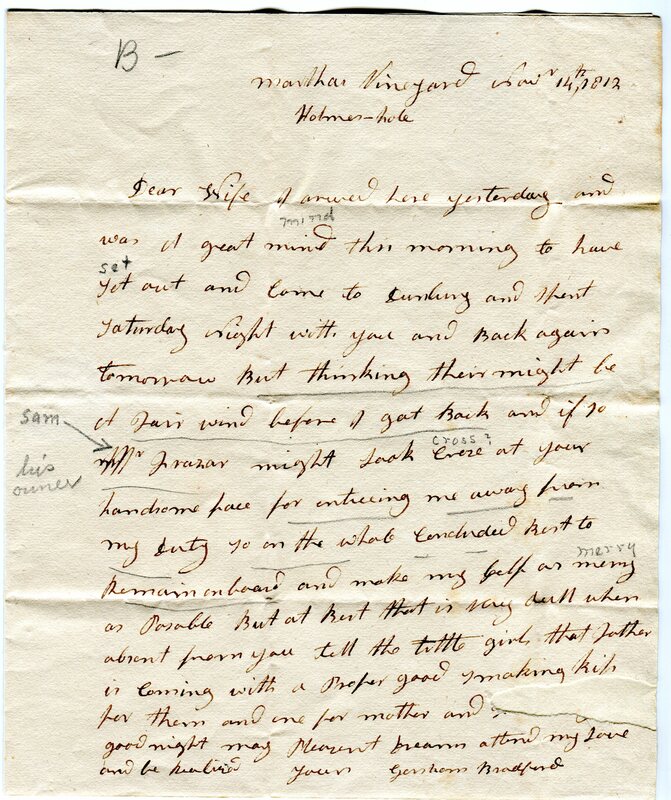 The following is a brief love letter Captain Gershom Bradford (1774-1844) penned to his wife, Sarah Hickling Bradford (1772-1861), before heading to Boston aboard the brig Patriot. The Captain was away quite a bit as a master mariner during their early marriage. At the time of this letter Sarah would have been pregnant with their fourth daughter, Charlotte (the Civil War nurse). You will notice the “B-” written atop the scanned image. Much of the Bradford correspondence was graded by descendent, also named Gershom Bradford. The B- might seem a poor grade for such a lovely little note but, given the length and topics of other letters, it was probably a fair assessment in his eyes. This entry was posted in Collections and tagged Bradford, brig Patriot, Duxbury, Gershom Bradford, Martha's Vineyard, Sarah Hickling Bradford. Bookmark the permalink. ← Vote! And Thank You Judith Winsor Smith.